You can get your hands on a Brother thermal label printer for $65-75. But if you don’t want to buy the Brother branded continuous feed paper for it you’re out of luck. Unless you pull off this hack which lets you use any thermal paper you want with a Brother QL-500 printer. The printer is tied to the OEM paper because of a pattern printed on the back of the roll. It’s basically an encoder strip made up of black rectangles spaced at regular intervals. Surely there are other brands that come with this pattern on them, but if you want to use paper without it the secret is in moving the sensor that reads that strip. 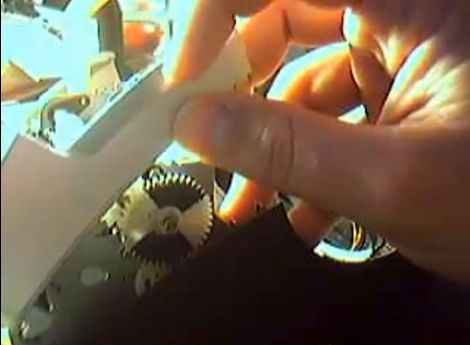 The brilliant solution is to use one of the white feed-gears as an encoder wheel. [CheapSkateVideo] used a magic marker to paint two opposite quarters of the gear black. He then removed the optical sensor and placed it on the side of the case facing the wheel. It needs to be adjusted along the radius of that gear until the timing is just right, but once it is you’re ready to go. The sensor is a safety feature to ensure there is media in the printer. If there’s not you can burn up the print head so keep that in mind. See the explanation in the video after the break. This, has made my day. That’s me BTW. I must now re-evaluate my life goals. Make it on hackaday, check. I don’t see why you couldn’t still use this with lables. Maybe a little 8pin microcontroller to send pulses to the sensor wires and then timing profiles for each lable type might be a good progression for this. I had thought about doing something with a micro, the issue was that at the time, I didn’t know how. Also, the reason you cant use separated labels with this particular hack, as I’ve done it, is because the markings are different on labels. Or just dont buy those printers. There are IBM and other printers for lower prices that use industry standard blank rolls. If y ou have one for free? yes hack it. If you are buying one, avoid the junk that is brother. Agreed. I wouldn’t have purchased it except that OfficeMax was trying to get rid of it and I talked them down to $6. Six Bucks? Not gonna pass that up. Yah I agree too! Why buying something that you think doesn’t help you anyway? So if it’s free then go but BUYUNG? just don’t do it. To keep the printhead from burning out, just add a microswitch / opto-interrupter setup below the print head to act as a paper out detector. Again another post of something I’ve already done… amazing. So I have two of these printers, the QL-570 and the QL-700. They are great printers and well worth the money if you are into shipping things. You can print shipping labels directly from Paypal and Ebay with these printers. On Paypal just select the QL-550 driver, it works fine. As for this hack, I guess it’s pretty clever for standard receipt paper… but there are sellers on Ebay that sell continuous rolls of label paper for $5 for a 100 foot roll (with the black ticks on the back). One roll would print about 150 shipping labels, or stickers or whatever you want. To use those rolls, you just modify your spool holder to press down the right button combination on the printer. There are tutorials for this just google it. I don’t see how the radius of the wheel has anything to do with the timing: whether you put it closer to the center or closer to the edge, if the wheel turns 360 degrees (e.g. in one minute), the sensor always passes two black parts in that same timeframe. Yeah, I dunno where [Mike] got that idea. You have to tweak the distance between the sensor and the gear. Just did this hack for myself on a QL-560, exactly the same as far as i can tell. While doing the Hack, I broke the cable on the sensor. Any idea where can I get a replacement cable and sensor. to enable paper out detection (and avoid burning the print-head) add a whisker microswitch to detect presence of paper before the feed roller.and wire its N.O. contacts in series with the LED of the optosensor. of if the geometry is suitable fashion a flag that falls between the opto and the gear when there’s no paper before the feed roller, Aluminium sheet from a drink can may be a suitable material.